What's Your Latest Walking Kit Purchase? Re: What's Your Latest Walking Kit Purchase? OMM Chest pack.4.5 L with map pouch.Tried it today ; happy with it.Carried my Garmin, my gps (Viewranger) dedicated simless phone, small camera , a few antistatic wipes and a few snack bars, with space for the tablets I musg carry. Space behind zip compartment for maps but think they need to be in a zip lock were I to keep them in there because that bit is open (ish) to the elements and I think if the wind and rain were coming straight at me they would get soaked. Happy chappy, does what I want it to. Walking trousers for £24.99. They arrived today, they fit well, have stretch panels, good pockets. The material, though light weight, feels tough. First time I've ordered from Decathlon and I'm impressed. Judging by the numbers of hikers I've seen on my foreign travels this seems to be a very popular brand, they have the Quechua brand in their range. I make this comparison with the gear I have from ME, Paramo, Montane, etc, so it's an informed comment, although how the trousers will perform in the field is another matter. Cheapo thin pair of gloves from Poundland - cost £2. Not a bad lightweight glove for day to day use. Mmm, Pound land? ? ?I suppose that would be one pound per glove. Looks and feels good . Ideal for chilled and hot water . Just the job for hikeing and camping . Just ordered a pair of cheap wetsuit shoes to wear when wading rivers. I've been wearing trail shoes for this but their getting quite tatty and the neoprene ones are cheaper and should be a little lighter. I've a couple of trips planned where crossing rivers will be unavoidable. I did this a couple of years ago. They are also used as my footwear when I take my boots off of an evening. Light as a feather yet surprisingly padded against sharp objects. 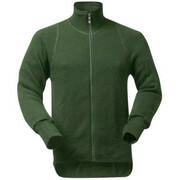 I have just visited Decathlon and have bought one of their £24.99 merino baselayers. In the past, everytime I've worn merino I itch. If I still itch with the Decathlon brand I'll give it to my nephew. Ordered 10.00 yesterday, arrived 10.00 today, not bad service. I ordered then from Lomo wetsuits in Glasgow. There actually exactly the same weight as my old trail shoes - inov8 285's. But only £13. I've used Lomo a lot for ordering stuff for work - 60 litre drybag rucksacks for boat landings at lighthouses. A Merino Wool 'Cardigan / Fleece. These are supplied to the French Military and I managed to pick up an 'unused' one for £35 inc P+P. I could not justify over £100. Very thick and it seems very warm - not a thin 'base layer' type of thing. Extra long sleeves with 'thumb holes'. The Woolpower Ullfrotte Original Full Zip Jacket - 400g can be worn directly next to the skin as a base-layer, or as a mid-layer garment. In very cold conditions it can be worn over the top of a Woolpower - 200g turtleneck. Each garment features a terry-knit soft inner in fine merino wool, reinforced with polyamide for better wear-resistance, making it comfortable yet durable. Each garment part is knitted conically to reduce the need for seams, providing a great, comfortable fit. Woolpower - 400g clothing has a unique warming ability because of its construction and material: moisture is wicked away from the skin keeping you dry, while the wool is capable of retaining body heat even when damp. Flame-less flask. Following Sussamb's thread regarding cooking stoves I mentioned the flame-less system and yep, I went out and bought the flame-less flask. Cost a tenner with 5 x 20gm fuel pouches. For this you get a neoprene cover, a plastic outer flask a removable stainless steel inner and a clip on lid. I have tried it out twice ( cup a soup & hot chocolate, not together though). You pop an fuel pouch into the plastic outer, pour on 40 ml of water pop in the steel liner with the goodies plus the appropriate amount of water, fasten the lid and wait a couple of minutes. I have to say that the drink was piping hot in no time at all. the set up was much quicker than getting out and setting up any type of stove I have ever seen, and weight wise is way lighter than jetboils. As for safety well it is flame-less and the fumes are stated as being non noxious. Completely won over by this little flask which can be used to carry water when not in use as a cooker. Thinking about getting the full system for cooking food, the flask may be good for pot noodle type things but who wants that? The great thing about this system is that it can be used inside your tent safely, probably even inside your bivi. It is naturally flameless so safe to use on tinder dry moors, woodland etc. Light. 5 fuel pouches = 100gm. not heavy. Cons getting the fuel pouches in the first place, though decent paint shops sell quick lime in quantities so you may be clever enough to make your own pouches at a fraction of the cost. Looks good Jimbob. I'll have a look at one of those. Thanks! @jimbob do you have a link for the one you bought please?